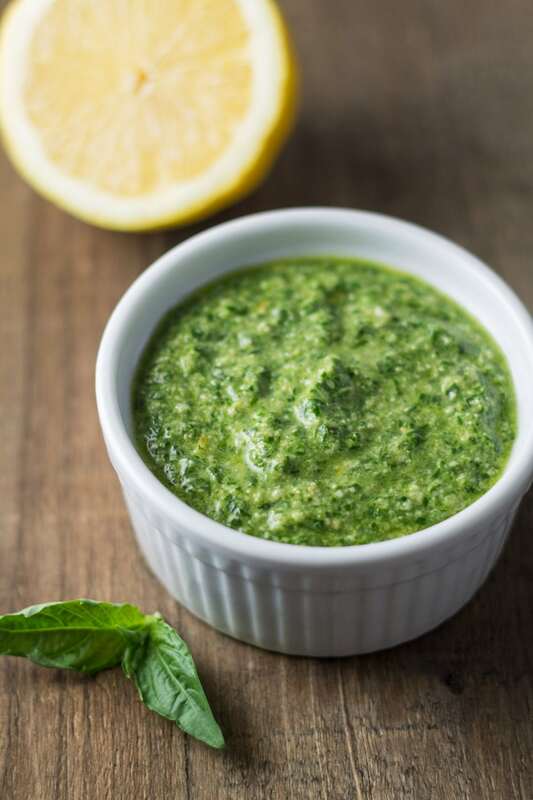 Add FODMAP-friendly flavor to pasta, chicken, sandwiches and more with this simple and dairy free Low FODMAP Pesto recipe made with fresh herbs, lemon, and garlic-infused olive oil. If it came down to just simple chemistry, olive oil infused with garlic cloves should not contain FODMAPs. FODMAPs are water-soluble, not oil-soluble, meaning they can dissolve into water, but not oil. 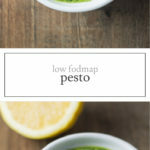 This is great for us low FODMAPing folks because garlic-infused olive oil will give us some garlic flavor without the FODMAPs. 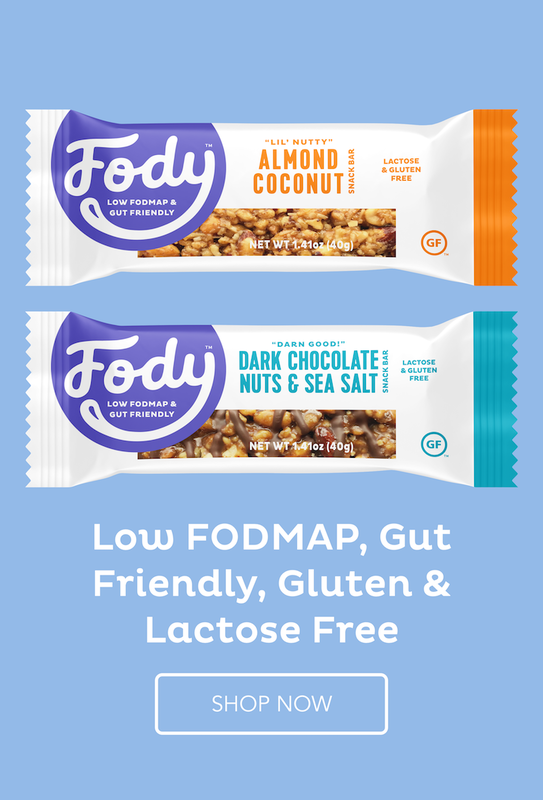 If you’re just starting on you low FODMAP journey and aren’t aware of your personal tolerance levels, it’s best to stick with a known low FODMAP product like FODY Food Co. Garlic Infused Olive Oil. 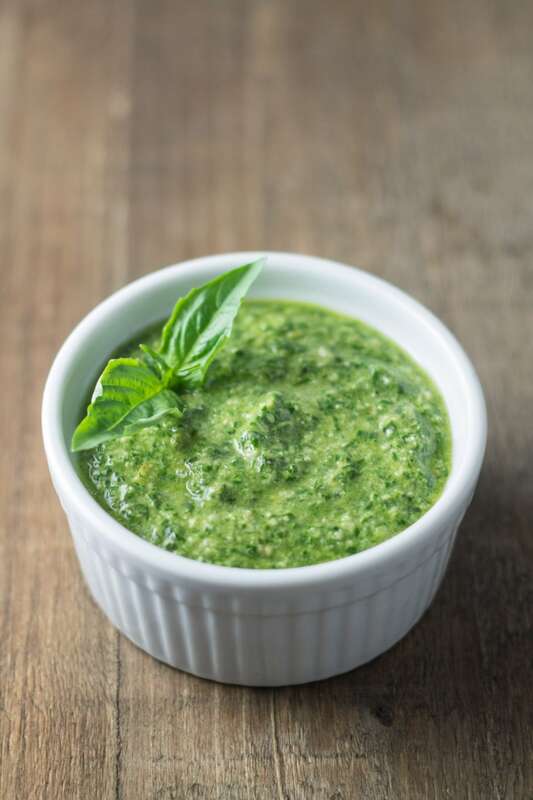 I like to toss this pesto with brown rice pasta or zoodles (zucchini noodles) for a quick and tasty side dish. It’s also delicious spooned over grilled chicken, spread onto sandwiches or used on low FODMAP pizza! Place basil, chives, pine nuts, and lemon juice in a food processor. Process until roughly chopped. Continue to process slowly adding olive oil until desired consistency is achieved. Season with salt and use immediately or freeze in ice cube trays until solid and transfer to a zip top bag for use within three months. Thanks for this recipe! This was my first time making pesto, and I’m glad I did. I used it on belly-friendly pizza. 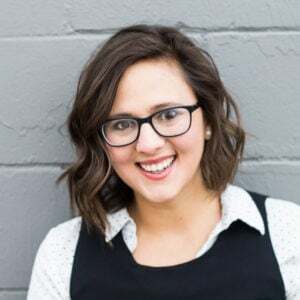 Great to hear, Krista! Thanks for sharing! I like this recipe a lot. 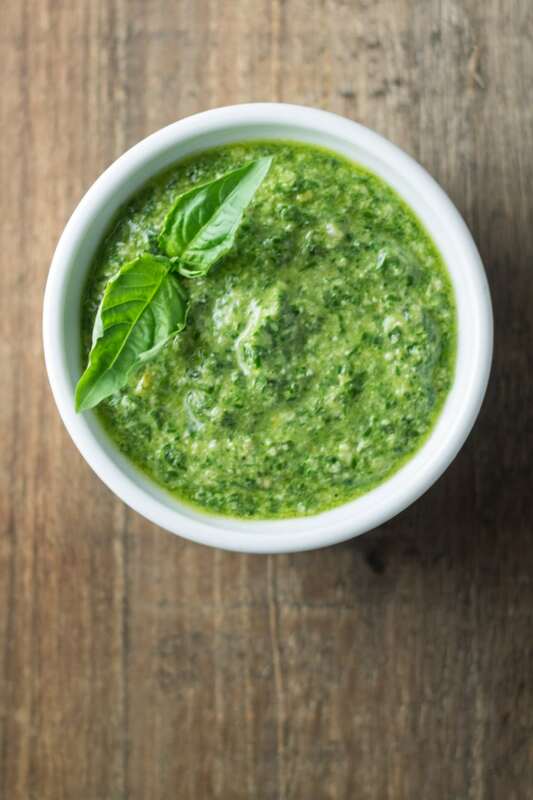 Pesto is one of my favorite (if not my FAVORITE) condiments. I subbed walnuts (all I had! ), handful of cashews and extra chives. Thanks for the post! Do you recommend how to find a garlic oil that is truly infused and therefore low FODMAP! Hi Rob, Thanks for the question! FODMAPs are not oil-soluble (they do not dissolve in oil). Most garlic-flavored oils should be tolerated on the low FODMAP diet. Even oils with garlic pieces still in the bottle should be tolerated, as long as the garlic pieces are not consumed. If you’d like to take the guesswork out of it, FODY foods makes a Monash-certified low FODMAP garlic infused oil. Hope that helps!